Wales have suffered a fresh world ranking blow after dropping five places down the latest Fifa list to 117th. 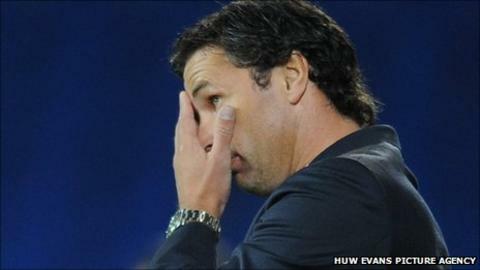 Gary Speed's team have fallen below Azerbaijan, Guatemala, Guyana, Korea DPR and Haiti in the August standings. Wales were overtaken by the Faroe Islands in July and were among the sixth and last Uefa seeds for the recent World Cup draw. England climb from sixth to fourth, with Scotland in 55th and Northern Ireland in 59th place. Wales now face a tough task to qualify for the 2014 World Cup finals in Brazil after being drawn in Group A with Scotland, Croatia, Serbia, Belgium and Macedonia, who are managed by former Wales boss John Toshack. The Republic of Ireland have risen to 31st in Fifa's list, while the Netherlands swap places with Spain at the top of the rankings. Brazil drop out of the top five into sixth place. Meanwhile, Wales Women remain in 47th place in the Fifa rankings.